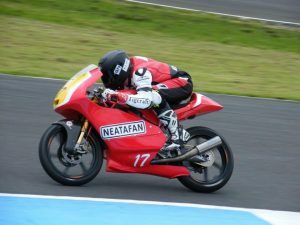 Neatafan continue to partake in the HEL Performance MotoStar British Championship, which runs alongside the British Superbike Championship. For 2017, the selected rider is Tom Carne, a 23 year old young man with an impressive track record in racing already. The 2017 season for Neatafan-Tigcraft had started at Donnington Park in April with last years machine as we were still building the new bike. A few points were collected before the Oulton Park (round 3) debut of the 2017 bike when the incomplete air intake ducts left us trailing behind with a major power shortage…. Round 4 at Knock Hill in Scotland was the real start to our season with the bike in its finished form! However, two crashes and a shortened qualifying session left us starting in 20th place with less than ideal gearing. Despite this, Tom Carne managed to move through the field, finishing 13th with a lap time 1.5 seconds off the leader (0.5sec due to the poor gearing). We have a bit of work to do but the whole team is really focussed on delivering better results in Round 5 at Snetterton in early July. So watch this space!